Phoenix real estate market predicts sustained growth as winter nears. 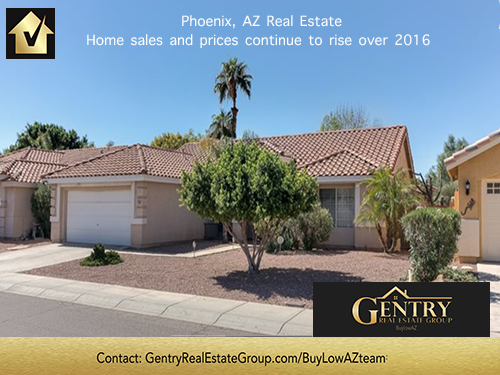 As weather forecasts up North and back East call for snow and ice in the months ahead, the Phoenix market is expected to continue to grow into 2018. While no one can guarantee future appreciation, very few real estate markets present the scope of growth potential serving as wide a range of investment goals as Phoenix. Home sales in the Phoenix market were up 3% this September and October from last year. The average sale price was up a hefty 5% over September 2016, and 10% over October 2016. Plus, the number of homes on the market in Phoenix increased by 3% in October over September 2017. Gentry Real Estate Group/BuyLowAZteam helps investors and homebuyers find the best houses and properties for profit potential Arizona has to offer.